On 4 July 2018, the WTO released a report stating that new trade-restricting measures by G20 economies have doubled since the previous review period. As protectionism is on the rise, the question of why politicians prefer protectionism– one of the traditional research questions in the field of international economics– is becoming more important than ever. We often observe politicians, in their election campaigns, calling for protectionist trade policies by emphasising the negative impact of trade liberalisation or the rise in imports. In many cases, politicians may either switch to accepting trade liberalisation or curtail their opposition once the election is over. Thus, politicians may support protectionism merely to get elected. Protectionism and electoral pressure are likely to be related. In this column, I introduce empirical evidence from Japan to show that politicians from constituencies facing a substantial increase in imports and, therefore, stronger electoral pressure, are more likely to advocate protectionist trade policies. Recent studies in the US have attempted to elucidate the impact of the rapidly increasing imports from China on domestic policy formation. They are based on the estimate of significant job losses (2 to 2.4 million) in manufacturing in the US due to rising imports from China (Autor et al. 2013, Acemoglu et al. 2016). In addition, there are some empirical results that show that greater competition from China affects election outcomes or trade policy preference in Congress. For example, Autor et al. (2016) analyse congressional elections from 2002-2010 and find that Chinese import shocks increased political polarisation in US congressional districts. Che et al. (2016) analyse congressional elections in the period 1992-2010 to show that congressional districts exposed to import competition from China are more likely to elect Democrats, who are generally more protectionist than Republicans. Focusing on the 2016 US presidential race, Autor et al. (2017) report that the exposure of the local labour markets to greater import competition from China aﬀected voting behaviour; in this case, the rising import competition led to Republican vote share gains. To consider the direct impact on trade policy, Feigenbaum and Hall (2015) examine whether the greater exposure to Chinese imports affects legislators’ roll-call positions on trade bills and electoral outcomes in the US House of Representatives in the period 1990-2010. They provide evidence that local economic shocks, caused by the influx of Chinese imports, force legislators to vote for protectionist trade policies. The evidence from the US suggests that strong import competition is related to the rise of protectionism. Several empirical studies have suggested that electoral pressure is one of the causes of politicians’ protectionism. Politicians may switch their policy stance to favour populist policies when faced with a challenging situation in elections. Conconi et al. (2014), who examine the determinants of legislators’ votes on trade policy using the results of votes on major bills in the US Congress since the 1970s, show that senators are more likely to support free trade policy than House representatives, unless the senators are serving their final term. This result suggests that re-election incentives deter legislators from supporting free trade policies. Moreover, they report that the protectionist effect associated with an impending election is not observed for senators who hold safe seats, that is, those in which the margin of victory in the previous election exceeded a certain percentage. Similarly, I have used data on the trade policy preferences of candidates for the Japanese House of Representatives election in 2012 to show that those projected to win the election narrowly are more likely to favour protectionist trade policies than those likely to win with a substantial margin (Ito 2015). Taken together, these findings imply that electoral pressure pushes politicians to adopt protectionist policies. Thus, we would expect politicians, facing competitive pressure in an election because of trade shocks, to exhibit a more protectionist streak. In a recent analysis I empirically examine the determinants of politicians’ trade policy preferences using candidate-level data from Japanese general elections in 2009-2014, paying attention to the link between trade shocks and electoral pressure (Ito 2018). As in the US, Chinese imports to Japan have increased dramatically, and account for a quarter of its imports. Figure 1 shows Japanese imports from China over the past ten years, based on the RIETI Trade Industry Database 2015, which classifies trade data into each production stage. The two curves in the figure indicate whether the imported goods were used as intermediate/capital goods or for final consumption. 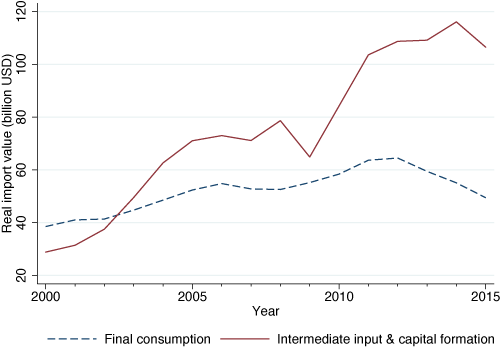 As is evident from the figure, the increase in imports for use in production is more prominent than those for consumption; furthermore, the value of goods imported for consumption seems to have decreased after 2011, the year in which the Great East Japan Earthquake occurred. Politicians may be sensitive to higher imports of products that harm manufacturers in their constituencies and, in response, may prefer protectionist trade policies. In the national elections held since 2012, as Japan’s participation in the Trans-Pacific Partnership (TPP) agreement negotiations emerged as a major policy issue, the scope for further trade liberalisation became one of the main issues. An interesting finding from a survey of about 10,000 individuals in Japan (Ito et al. 2015, Tomiura et al. 2016) is that the majority of voters agrees with further trade liberalisation; in contrast, the majority of candidates standing in the national election supports protectionist trade policies (Ito 2015, 2018). My first finding is that an increase in import exposure per worker in a candidate’s constituency deters him or her from supporting trade liberalisation. The protectionist effect may be mitigated by exports, which are considered to have a positive economic impact on the local labour market (Dauth et al. 2014). However, this protectionist effect is not offset by more exports from the constituency. Moreover, the remarkable finding of this study is that the protectionist effect caused by import exposure varies according to the intensity of the competition in elections. Considering electoral pressure, I focus on three factors: incumbency, intercameral differences, and vote margin. In general, incumbents are in a more advantageous position than first-time candidates, in terms of both finance and degree of recognition (Gelman and King 1990, Lee 2001). Non-incumbents are more exposed to the pressures of an election than incumbents. With respect to the intercameral differences in Japan, the members of the House of Representativesare considered to be more sensitive to the voices of voters than those of the House of Councillors. The former face uncertainty during their three-year term about the potential dissolution of Parliament and the fresh elections that follow, whereas the latter have a guaranteed six-year term. As for the victory margin, there is a view that it is easier for politicians who have the support of a large number of voters in the election to appeal for reformist policies, while stiff electoral competition leads candidates to select more moderate policies. The results of the regression analyses show that non-incumbents, candidates who run for the House of Representatives, and candidates with a low vote margin are more sensitive to import exposure in their constituency and, therefore, more protectionist. The results suggest that as the electoral pressure increases, politicians attempt to acquire votes by using trade shocks as a legitimate reason to advocate for protectionist trade policies. It was predicted that the 2016 US presidential election would result in a close tie, and the protectionist policies between the candidates stood out as a major issue. Although it is not the focus of this research, the outcome may be consistent with the results of this research. The call for protectionism following trade shocks is sensitive to electoral pressure. In order to suppress protectionism, it is necessary to take into account not only matters related to trade but also the electoral pressure among politicians. We need to recognise the presence of a dynamic mechanism that explains politicians’ choice of protectionism during elections. Acemoglu, D, D Autor, D Dorn, G H Hanson and B Price (2016), “Import competition and the great US employment sag of the 2000s,” Journal of Labor Economics 34(1): 141–198. Autor, D H, D Dorn and G H Hanson (2013), “The China syndrome: Local labor market effects of import competition in the United States,” American Economic Review 103(6): 2121–2168. Autor, D, D Dorn, G Hanson and K Majlesi (2016), “Importing political polarization? The electoral consequences of rising trade exposure,” NBER Working Paper No. 22637. Autor, D, D Dorn, G Hanson and K Majlesi (2017), “A note on the effect of rising trade exposure on the 2016 presidential election,” mimeo. Che, Y, Y Lu, P Schott and Z Tao (2016), “Does trade liberalization with China influence U.S. elections?,” NBER Working Paper No. 22178. Conconi, P, G Facchini and M Zanardi (2014), “Policymakers’ horizon and trade reforms: The protectionist effect of elections,” Journal of International Economics 94: 102–188. Dauth, W, S Findeisen and J Suedekum (2014), “The rise of the East and the Far East: German labor markets and trade integration,” Journal of the European Economic Association 12: 1643–1675. Feigenbaum, J J and A B Hall (2015), “How legislators respond to localized economic shocks: Evidence from Chinese import competition,” Journal of Politics 77(4): 1012–1030. Gelman, A and G King (1990), “Estimating incumbency advantage without bias,” American Journal of Political Science 34(4): 1142–1164. Ito, B (2015), “Does electoral competition affect politicians’ trade policy preferences? Evidence from Japan,” Public Choice 165(3)” 239–261. Ito, B (2018), “Trade Exposure and Electoral Protectionism: Evidence from Japanese politician-level data,” Discussion Paper 18-E-034, Research Institute of Economy, Trade and Industry (RIETI). Ito, B, E Tomiura, H Mukunoki and R Wakasugi (2015), “Trade Policy Preferences and Cross-Regional Differences: Evidence from individual-level data of Japan,” Discussion Paper 15-E-003, Research Institute of Economy, Trade and Industry (RIETI). Lee, D S (2001), “The Electoral advantage to incumbency and voters, valuation of politicians, experience: A regression discontinuity analysis of elections to the U.S. House,” NBER Working Paper No. 8441. Tomiura, E, B Ito, H Mukunoki and R Wakasugi (2016), “Individual characteristics, behavioral biases, and trade policy preferences: Evidence from a survey in Japan,” Review of International Economics24(5): 1081–1095.